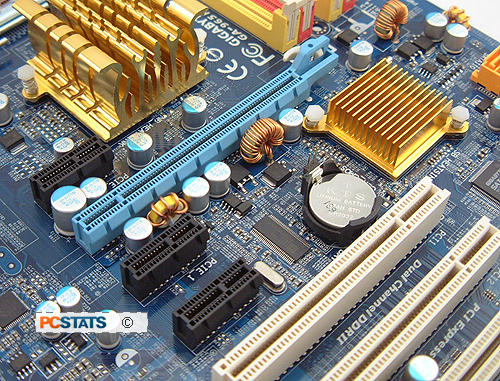 Motherboard chipsets generate a lot heat which is why Gigabyte places two rather large passive heatsinks on the Intel P965 Express and Intel ICH8 chipsets. If you plan on building a new Intel Core 2 Duo system, you'd better have good airflow in your system! 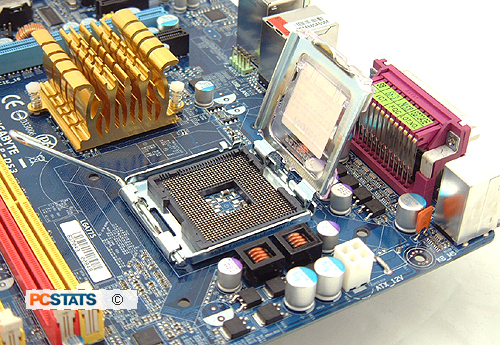 The Gigabyte 965P-DS3 motherboard features three PCI, three PCI Express x1 and one PCI Express x16 expansion slots. Some say that Intel dropped the ball with the ICH8 by doing away with parallel IDE support. That has left motherboard manufacturers scrambling to include IDE controllers on new Core 2 Duo motherboards. Gigabyte includes a proprietory IDE/Serial ATA controller on the GA-965P-DS3 that offers us one IDE channel and two extra SATA2.0 channels. Obviously, the IDE is best served supporting optical drives, and SATA hard drives. The front panel connectors are colour code, and polarity is marked for the LED activity lights. 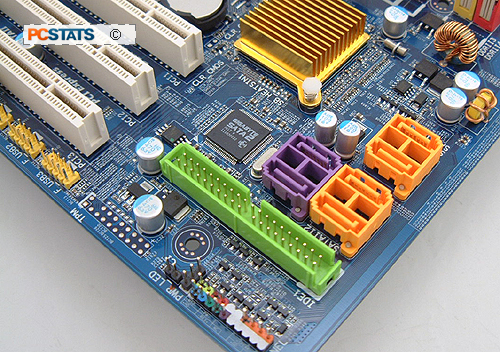 There are three USB2.0 headers located along the edge of the Gigabyte 965P-DS3 motherboard. There is no support for IEEE1394 Firewire however. 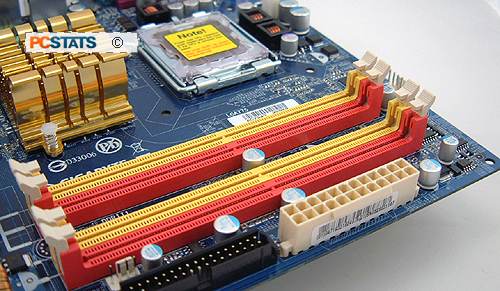 The four DDR2 memory slots accommodate up to 8GB of DDR2-400/533/667/800 memory officially, although Gigabyte goes one step further by allowing support for 1066 MHz DDR-2 RAM. The GA-965P-DS3 has its memory slots colour coordinated so it's easier for users to enable dual channel memory support by installing identical pairs.